"Good service and good villa." 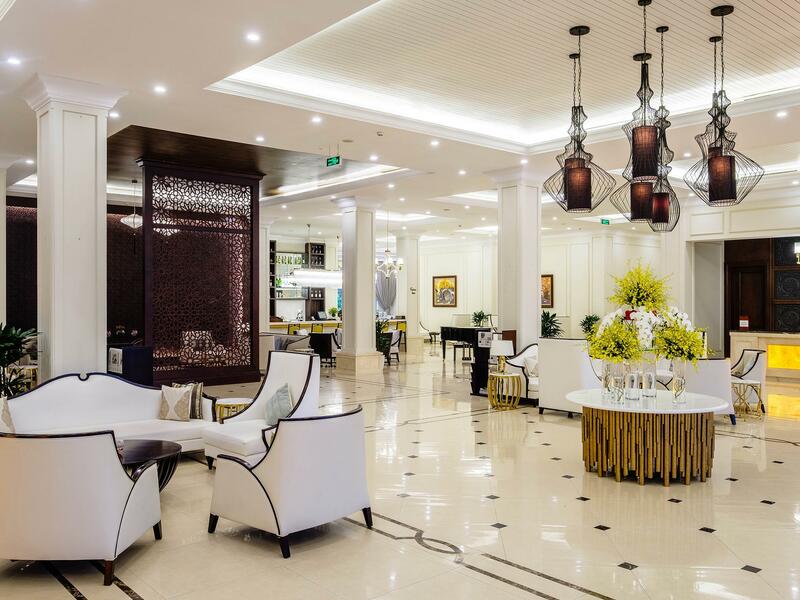 Have a question for Vinpearl Resort & Spa Da Nang? "I will go to stay again once going to Da Nang." "Highly recommend this wonderful hotel !" "the hotel's facilities are great for guests to have leisure time." "I love its swimming pool and beaches nearby." 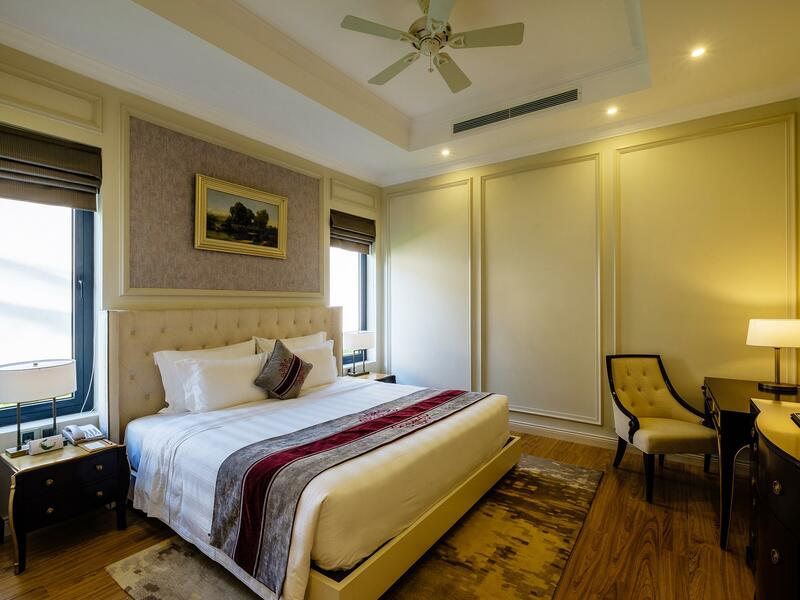 Whether you're a tourist or traveling on business, Vinpearl Da Nang Ocean Resort and Villas is a great choice for accommodation when visiting Da Nang. Only 17 km away, this 5-star hotel can be easily accessed from the airport. With its convenient location, the hotel offers easy access to the city's must-see destinations. At Vinpearl Da Nang Ocean Resort and Villas, the excellent service and superior facilities make for an unforgettable stay. This hotel offers numerous on-site facilities to satisfy even the most discerning guest. The hotel features 122 beautifully appointed guest rooms, many of which include additional bathroom, bathroom phone, free welcome drink, private entrance, slippers. Whether you're a fitness enthusiast or are just looking for a way to unwind after a hard day, you will be entertained by top-class recreational facilities such as fitness center, outdoor pool, spa, massage, kids club. Discover an engaging blend of professional service and a wide array of features at Vinpearl Da Nang Ocean Resort and Villas. "The hotel spa is nice." - Children under 1 meter will be considered as under 4 years old. - Children 1-1.40 meters will be considered as 4-11 years old. - Children above 1.40 meters will be considered as adults. 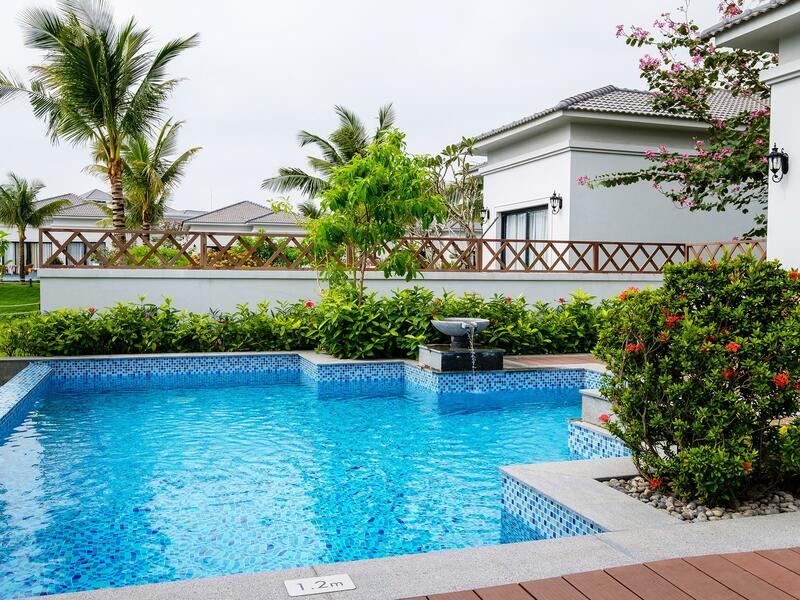 The property requires a security deposit in a local currency (VND) for the use of additional services, which will be refunded upon departure if no additional services apply. For guests booking full board package, dinner will be served on the arrival date, and breakfast and lunch will be served on the following day. Guests who prefer lunch to be served on the arrival date are required to contact the property at least 5 days prior to arrival. When booking for 6 or more rooms, different policies and additional supplements may apply. The 2-Bedroom Villa has a maximum occupancy of 4 adults and 4 children. The 3-Bedroom Villa has a maximum occupancy of 6 adults and 6 children. Children under 4 years old stay for free if using existing bed. Children 4 years and over are considered as adults. Breakfast was excellent, I recommend you try both hot and cold coffee options. There nearly nobody on the beach, so you can have almost the beach for yourself. Hotel staff was extremely polite and helpful. The villas were very luxorious. The only negative thing is that there was only a few restaurants in the neighbourhood. However taxi to Na Dang costs only 4-5 euros on way and there are plentiful of taxi which all have reliable taxi meter. On the other the location was nice because there was no city noise and business in the resort. Very nice stay in this hotel for groups. I have booked 2 nos. of 2-bedroom with private pool. My friends and I are very pleasant for our accomodation. The hotel has cart service to drive point to point. The hotel spa is nice. I love its swimming pool and beaches nearby. I will go to stay again once going to Da Nang. Keep going to work better Vinpearl resort & spa team. Thank you. Nothing shops nearby the hotel. But the hotel's facilities are great for guests to have leisure time. The staff are very friendly and helpful. If the swimming pool can remove the plants facing to the sea. It will have better view. Enjoyed our stay in this hotel for us. we have totally 8 people. Keep going for its service and good facilities! We brought our 1 year old child together with grandparents. Since they cannot move around the town, we chose to chill out at the hotel, And we made the perfect choice to stay. Although there are not many choices of restaurant at the hotel, but other facilities are wonderful. We love to come back again. I was absolutely satisfied during staying Vinpearl 2. Awesome scenery, clean room and furniture, kind staff, everything is good. So kind staffs are your big asset. highly recommend this wonderful hotel ! good service and good villa. The photos on the agoda website are not for this property. The villas are nice but there are no utensils, plates, cutlery etc to cook. Most staff speak minimal English. This is not a resort but rather villas with a restaurant and one pool. Xin chào Gabrielle, On behalf of our hotel management board, I would like to send our gratitude to you and your family as your vacation destination. Your feedback is highly appreciated since thanks to them, we need to make a detailed plan to improve our customer services. We are kindly seeking for your understanding for this matter. Please rest assure that we are eager to look forward to welcoming you back and make your trip unforgettable. Hope to see you at Vinpearl Danang Ocean Resort & Villas in the soonest time. Sincerely yours, Thao Le Front Office Director. 규정된 체크인 시간 2시 보다 1시간 30분 일찍 도착했는데 한국인 호텔직원이 친절하게 도와주어 어얼리 체크인했습니다. 4인용 2층 풀빌라 예약했는데 공간도 넓고. 깨끗한 편이었습니다. 가격대비 만족. 프라이빗 비치도 걸어서 5분 거리여서 일출도 보고 해질녁 산책도... 올드타운. 다낭시내 중간이어서 그랩 부르면 이동하기도 편리한 편입니다. 조식뷔페는 평타 정도... 지만 만족.. 아침은 간단히 하눈 편이라 불만족스런 점은 없었습니다. 직원들 친절하고 밝은 표정이 좋네요. 가족 동반 숙소로 괜찮습니다. 모든게 완벽합니다. 다만 시내와 조금 거리가 있긴 합니다. 얼리체크인은 안되었구 짐만 나두고 시내갔다가 체크인했어요. 미케비치와 조금 거리가 멀어 주변 먹거리가 거의 없어서 조금 아쉬웠지만 룸상태와 서비스는 너무 좋았어요! 특히 한국직원분 계셔서 도움 많이 받았네요ㅎ 숙소내 수영장은 물온도가 조금 차가웠구 화장실에는 따뜻한물 잘 나왔네요! 조식은 5성급치고 살짝 아쉬웠어요. 돼지고기랑 김치는 맛있었어요ㅋㅋ 보증금은 투베드룸 하루 기준 3백만동(약 15만원) 정도였으니 참고해주세요! 카드 결제가 편해요!! 중학교 친구들과 중년이되어 처음 함께 가는 해외여행에 선택한 빈펄 리조트 앤 스파 워낙 후기가 좋아서 기대를 엄청했어요. 그 기대를 뛰어넘는 곳이라 여행을 더 연장하고 싶을 정도 였습니다. 특히 리조트에 있는 모든 직원들이 웃는 얼굴로 인사를 건네 좋았어요. 숙소는 청결하고 편안하여 여행의 여독을 풀기 충분했습니다. 식사도 재료가 신선하고 맛있었어요. 이번 여름 가족휴가도 이곳으로 결정했어요. 곧 다시 만나요. 편안한 쉼을 준 스텝 모두 감사합니다.